silvieon4: Tasty Tuesday- Are the GIZZARDS WIZARDS ready? Hoomans eat duck gizzards like this: http://honest-food.net/2011/03/02/gizzard-confit-with-wild-mushrooms/. Ok, some hoomans. My daddy is NOT one of those humans. He is not into "parts". As a wise man used to say "Too bad for him, great for me!" Of course, we sort of deflated his interest when momma told him "Gizzards wizards". :) again ..."Too bad for him, great for me!" Here is the deal. Organ meat is very good for us four leggeds. Accounting for allergies and such, we found that JD can eat duck. So, Of course, momma got trays of duck gizzards. The preparation that we like is simple and delicious. While partly frozen, as a small block momma slices the gizzards. Use a serrated knife. It make the job easier and faster. and coat the slices. 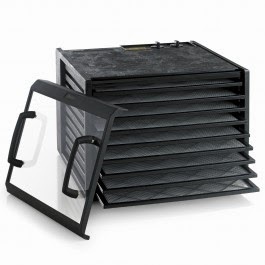 Put the slices in your dehydrator and set for 5-7 hours at highest setting. Check after 5, adjust time as needed. Look, you do not want to completely dehydrate the gizzards. You want them "cooked"- This recipe is a modified "confit". A confit is usually cooked slowly in fat. This is a leaner rif on that. That is why we add the coconut oil. Did you ask for a taste taster??? I am here, I am willing... I am the Kitchen QC supervisor! I am able...I will take a bullet for the team...I will taste test! Yea, that piece, give me that taste. Wiggling not just my tail, my whole body in approval! Oy yuh, the GIZZARDS WIZARDS are DONE! Hey hey hey... I need to taste every tray! What do you mean NO???? Are you impeding MY JOB???? DRAT!. She is so harshing my buzz. Who looks like a coffee table? Stop talking to auntie Robin!. Calories, shmalories... Give them to me, don't put them in the fridge!!! Dang it. Since we want everyone to be a winner, readers can use code PETLOVE (expires April 15) at checkout on www.Drying123.comor www.ExcaliburDehydrator.com to buy their own 4, 5, or 9-tray dehydrator with 15% off. But really, try and and win one for FREE! Life is good. 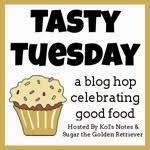 I love Tasty Tuesday. Mom says "ewwwwww" but I agree, too bad for them!! As i dog, Bentley thinks Gizzard Wizards sound amazing!